We're changing lives through cycling. is a syndicate of volunteers devoted to InCREASING THE MOBILITY OF OUR NEIGHBORS. An easy way to help! Amazon Smile is a program that lets you shop for anything via Amazon, but have a percentage of your purchase be donated to a specific non-profit. You can go to smile.amazon.com and pick Tulsa Hub when you check out. Buy some awesome bicycle gear and lend a helping hand to a low-income neighbor? Click the image to go to Amazon and choose Tulsa Hub as your charity of choice. 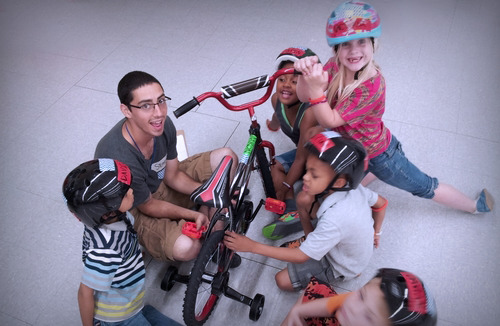 Tulsa Hub is the only non-profit in Oklahoma providing certified bicycling-for-transportation education, refurbished bicycles, safety gear, and follow-up support to the impoverished, mentally ill, or otherwise disenfranchised in our community. Tulsa Hub is powered by volunteers, donations, and financial gifts from the community. We have a wide variety of volunteer opportunities and are in need of used adult and kid bicycles, helmets, bike tools, shop necessities, and cleaning supplies.